The Field School, organized by the University of Southampton, will offer a combination of hands-on practical training and academic content. The academic content of the programme is primarily concerned with Roman imperial history and material culture, with a particular reference to archaeology of the Tiber delta and Rome. Fieldwork training will focus is on theories, techniques and strategies of survey and excavation, archaeological stratigraphy, sampling procedures, field data collection and recording methods, documentation and report preparation. Students will also learn to map, recover, catalogue, and process archaeological artefacts. The project also uses cutting-edge digital technologies and we can provide a training in a variety of techniques that we use in our work. Those with a specific interest in this area of our work or archaeological computing in general should get in touch to discuss the options as the programme could be tailored to suit their needs. 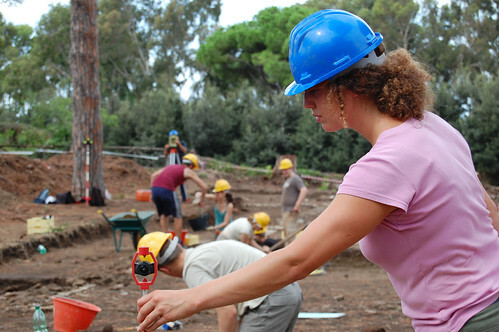 Simon Keay and Renato Sebastiani are scientific directors of the excavation; Graeme Earl is director of scientific recording and data capture; Dragana Mladenović is director of the Field School. Fabrizio Felici is the site Excavation Manager; Penny Copeland is the Finds Recording Coordinator; Kris Strutt is Health and Safety Officer; Roberta Cascino is Coordinator of site documentation and Contact person for students from Roma Tre and the Comune di Fiumicino; Steve Kay is Coordinator of topographic recording.